Gem Stone-Painted Jewelry Box offered comes with beautifully and intricately painted traditional lady on the lid's top facing surface. Suitable for keeping gemstones and other precious metals, these can be made available in different finish size options. These also feature innovative and interesting design patterns that suit the diverse tastes and preferences of our customers. 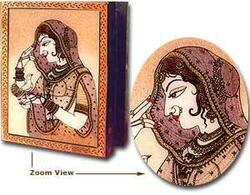 Indian Handicrafts started as a manufacturer and exporter of Handicrafts in the year 2001. We offer a comprehensive range of White Metal Ashtrays, Rehal / Book Rest, Brass Bowl, Brass Candle Holders, Wooden Coasters, Diaries / Planners, Nautical Gifts, Pen / Pencil Holders, Handpainted Tables, Earthen Diyas, Bandhanwars, Bird Hangings, Brass Flower Vases, Lord Ganesha, Buddhism, Sikh Religion, Jesus Christ, Resin God Idols / Figures, Beaded Handbags, Beaded Jewelry Boxes etc. Our range of products is carved using premium quality materials in our advanced manufacturing unit. These products are tested on various parameters to ensure their utility and efficiency. They are available in various specifications and can be custom designed as per the requirements of the clients.